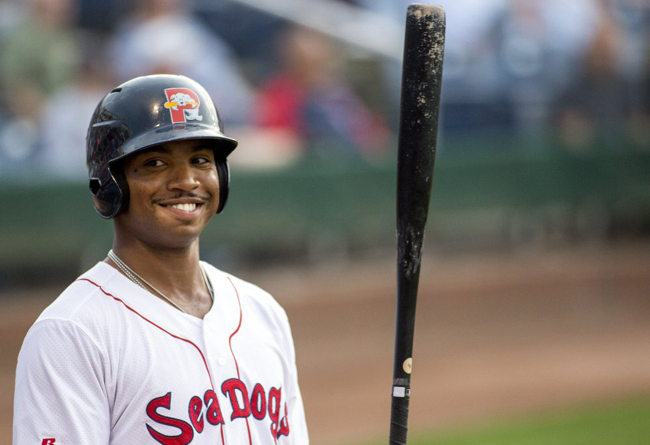 Three months ago, Jeremy Barfield was out of organized baseball; now he's starring for the Sea Dogs and reviving major league dreams. (Portland, Maine, Aug. 17, 2017) - From May 29 through Tuesday, only four professional baseball players had hit 22 or more home runs. Three are in the major leagues – Giancarlo Stanton, Cody Bellinger and Mike Moustakas. The other is in Double-A. Jeremy Barfield keeps swatting them out. His 22 home runs are already a record for the Portland Sea Dogs as a Red Sox affiliate, even though he did not join the team until late May. But why is he still on the team? If Barfield was a young prospect, Red Sox fans might be calling for his promotion. This is an organization that could use power. But several factors are keeping Barfield in Double-A. • He’s not young in baseball years. Barfield turned 29 in July. If he was in the Red Sox lineup Wednesday night, he’d be the fourth oldest player. • Lack of track record. Barfield has never reached the majors. He has 77 Triple-A games on his resume, the last of those coming in 2015. He spent last year and the start of this season in an independent league. • The organization. The Red Sox are stocked in young outfielders – with Mookie Betts, Jackie Bradley Jr. and Andrew Benintendi. In fact, Boston may have the most stacked group of minor league outfielders, with no place to go. In Triple-A Pawtucket, Bryce Brentz has hit 28 home runs, and Rusney Castillo is batting .308 with 14 home runs. So, is Barfield buried in Double-A? “I wouldn’t say that,” Sea Dogs Manager Carlos Febles said. “To me, he’s putting himself on the map. (With him coming) from independent ball, I wasn’t expecting him to do what he’s doing. “He can hit fastballs and breaking balls. He’s a very good hitter. I wouldn’t count this guy out. Something I would never give up on is power. Where can you find power? Barfield, who first played pro ball in 2008, knows better than to think ahead. “There’s nothing else to think about. I’ve been on my way out of this game the past two years. I’m just trying to keep my foot in the door,” Barfield said. Barfield was released in spring training in 2015, but played his way back into affiliate ball. But he did not get any offers in 2016 and played for the independent Sugar Land (Texas) Skeeters, hitting 27 home runs. When Barfield again did not get any offers in 2017, he considered retiring but was convinced by his wife to return. He hit nine homers for Sugar Land before the Red Sox signed him and sent him to Portland. “They said I’m going to Portland, and how I do will dictate my playing time. That’s it. That was good enough for me,” Barfield said. There are other elder Sea Dogs players with major league experience. They, like Barfield, can control only so much. “We’ve talked about it,” said corner infielder Mike Olt, 28, who has played for the Cubs and White Sox. “You just need to play, stay healthy and hope good things will happen. What about next year? Has Barfield talked to his agent? He chuckled at the question. But Barfield keeps the conversation in check. On Wednesday, Barfield went 2 for 4 with two doubles while also showing off his arm. With a runner on second base, Barfield charged a single and threw home on the fly, keeping the runner at third. Barfield finally has enough plate appearances to rank among the Eastern League batting leaders – his .309 average is third best, and his .992 OPS easily leads the league. His 22 homers rank fourth. The numbers make Barfield a legitimate MVP candidate.